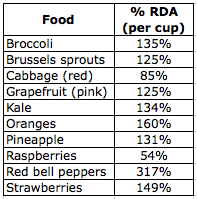 I hear so many people talking about vitamin C this time of year and I wonder if they know how easy it is to get this nutrient from eating real food vs. in supplement form. Vitamin C supplements are ok as a backup plan, but food is always the best source of all vitamins and minerals. Also, taking too much vitamin C can cause issues of the gastrointestinal variety. I won't elaborate here; you know what I mean! Vitamin C can help to ward off illness by boosting the immune system and it helps your body to absorb the iron in your food (especially non-heme, or vegetable source, iron). "Vitamin C is a water-soluble vitamin that maintains skin integrity, helps heal wounds and is important in immune functions. It also has antioxidant properties, helping to prevent cell damage by neutralizing free radicals, molecules believed to be associated with aging and certain diseases..."
Why not skip the supplements and opt for these food choices instead? If you strive to be a "locavore" (or wish to eat locally with the seasons instead of consuming produce that was grown far from home), citrus fruits and cabbage are at their peak in the winter. How about a cabbage salad with citrus dressing?